I. 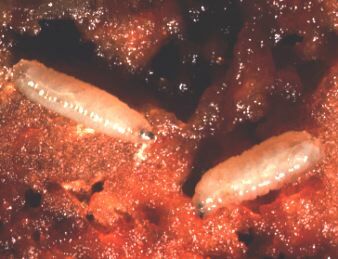 Introduction: The apple maggot (AM), also known as the "railroad-worm", is a potentially serious pest, but has not been a noticeable problem in commercial orchards in the mid-Atlantic region in recent memory. II. Hosts: Apple, especially early maturing and sweet varieties, and the native hawthorns (Crataegus spp.) are the preferred hosts of AM. In addition, the AM will attack crab apple, pear, cherry, plum and apricot especially when these fruit are planted near heavily infested apple or hawthorns. III. 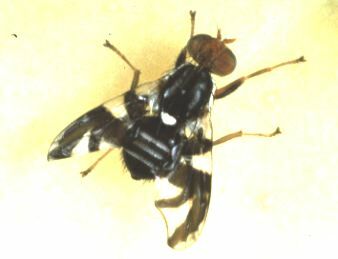 Description: The adult fly (Plate 8) is black with three (males) or four (females) white stripes across the body and a prominent white spot in the middle of its back. The wings are clear with four black bands shaped somewhat like the letter "F", as shown in the lower wing in the figure below. The adult is about 2/10 inch (5.8 mm) long with a 1/2 inch (12 mm) wingspan. The abdomen of the female is more sharply pointed and curved than that of the male. The maggot is small, white, and legless (Plate 9). IV. Biology: Adult flies start to emerge in mid June to early July (early June in Virginia; click here for emergence dates in selected Virginia counties), and continue emergence over a period of three months, with peak emergence usually in late July and August. Emergence patterns can vary considerably within the mid-Atlantic region, depending upon the type of host and environmental conditions, especially temperature, soil type, and rainfall. Emergence of adults is very low unless rain falls prior to emergence. Newly emerged flies are sexually immature and must spend time acquiring protein by feeding on honeydew excreted by other insects (e.g., aphids). The flies mature sexually within 1-10 days. There is a preoviposition period of about 7 days. The female fly makes a small hole in the apple skin and deposits a single egg. The egg hatches in a few days (e. g., 2-10) and the young maggot starts to feed, working its way through the fruit. Time spent within the fruit is usually 20-30 days. When mature, the maggot leaves the fruit and enters the soil to develop into the pupal stage where it remains until the following summer. Historically, this species has been considered to have only one generation each year; however, recent research indicates two generations. A small proportion of the population does not emerge as adults for an additional year, giving protection to the population from crop failures or biennial bearing, thus complicating control of high populations. V. Injury: Pitting and dimpling on the apple surface caused by the oviposition punctures (Plate 10), and brown, winding trails caused by the excrement of the maggot and an associated bacteria under the apple's skin (Plate 11), are characteristic of AM injury. Early maturing and thin-skinned apples are more severely infested and usually breakdown much faster. 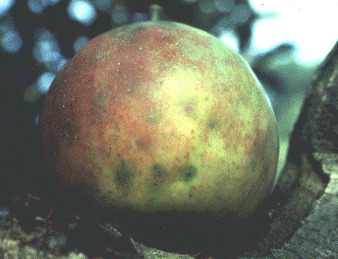 Many larvae may be found in a single apple. VI. 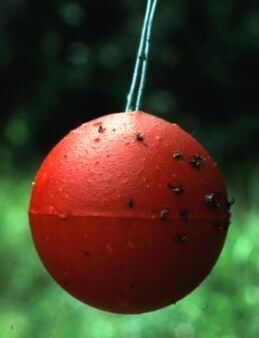 Monitoring: Adult AM flies can be monitored on either sticky red spheres (Plate 12) or yellow sticky panel traps (Plate 13). The red spheres mimic ripening apple fruits to which flies are attracted for mating and egg laying. The yellow traps mimic apple leaves. When using the red spheres, they should be baited with apple volatile lures which can be purchased from various suppliers for better attraction of flies. Both types of traps may be improved with the addition of ammonium acetate. The use of protein hydrolysate can greatly increase captures during the preoviposition period. Three traps are recommended per block, near its periphery, 1-2 rows in from the edge. Traps should be placed in the trees along the edge of the orchard around mid June, about head height, positioned so they are surrounded by fruit and foliage, but not obstructed from view and not touched by them. Trees that are closest to woods or abandoned orchards should be chosen. Traps should be inspected weekly until the end of August. Red traps are more sensitive under conditions on low apple maggot fly density. 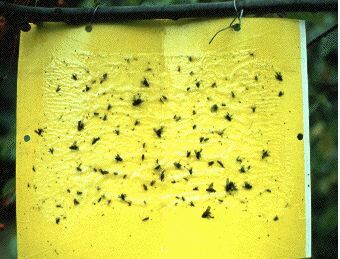 Based on research done at Cornell University, if an average accumulation of 5 AM flies per trap (using apple volatiles) are caught within a week, an application of an insecticide is recommended immediately. Capture of flies for 1-14 days following the insecticide spray can be discounted. Once 14 days have elapsed since the last spray, another application should be made if the cumulative total of 5 flies /trap have been captured within a 2 week period. If no apple volatiles are used, the threshold should be lowered to 1 fly/trap. A protocol to manage apple maggot in order to allow shipment to Brazil was put in place in the 1990s. This will need revision because of the organophosphate insecticides called for in that program. Red sphere traps may be used for actual control in home fruit settings according to New York research. Traps should be placed in trees at the ratio of 1 trap per 100-150 fruit, with a maximum of 3-4/tree. This is taken primarily from a chapter by L. A. Hull, D. G. Pfeiffer & D. J. Biddinger on apple direct pests, reprinted with permission from Mid-Atlantic Orchard Monitoring Guide, published by NRAES, 152 Riley-Robb Hall, Ithaca, New York 14853-5701. Chen, H., C. M. Felland & B. A. McPheron. 2002. Population dynamics of apple maggot (Diptera: Tephritidae) in south central Pennsylvania. J. Econl. Entomol. 95: 65-71.